Siriol Dafydd, Writer of all sorts. Obnoxious nutter. Addict of marathons. Agony, extasy, relief. 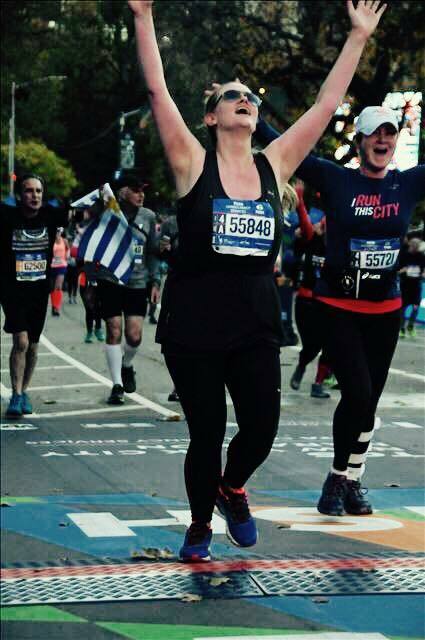 Crossing the finish line at the 2016 New York City Marathon. So I should start by telling you that I’m not clinically obese…but it is definitely safe to say that I could be in far better shape. This year I’ll be running the New York City Marathon for the second time. It will be my fourth full marathon to date. Over the last 8 years I’ve run 6 half marathons and 3 full marathons, but I’m still no fitter than I was when I started. In fact, I’m now probably in the worst shape of my life… but trust me, I’ll still cross that finish line. Ever since my first half marathon (for which I was severely undertrained and slightly hungover), I’ve been addicted to running races. I’m not fast or even remotely graceful. I don’t possess the slightest bit of natural talent or ability in this area. In fact, when I run, I look alarmingly similar to a slightly confused penguin that’s just accidentally soiled it’s undergarments. My legs don’t really bend like other runners’ for some reason. It’s an awkward little slow shuffle that just goes on for hours. It truly is a visual delight. Over the years, I’ve been asked many a time why I keep running (or shuffling) marathons and upon reflection I think it boils down to two things. Firstly, the atmosphere in a big city marathon like London or New York is absolutely incredible. Thousands of people cheer you on along the way and I can honestly say there’s no feeling quite like it. Your fellow runners are all pushing themselves to the limit (many of which for a noble cause) and the endless streams of people on the sidelines are there to encourage and support complete strangers through the ordeal. It truly is humanity at its best. The second (and main) reason I love marathons is for the challenge. I absolutely love doing something that I never thought I’d be able to do. Putting yourself through 5 hours of utter hell probably isn’t everyone’s idea of a nice Sunday morning activity but the satisfaction I get at the finish line, knowing that I’ve pushed myself through what I can only describe as horrendous physical and mental torture is immense. And weirdly, I think I get an extra bit of gratification out of knowing that because I’ve got the physique to match my love of pasta, cheese and alcohol in general, people are usually shocked to learn that I (and my belly) survived a marathon. I’m not going to pretend that I don’t sometimes wish that my spare tyre of a belly would magically disappear. Living in Bondi Beach is its own emotional marathon when you don’t have the world’s most perfect body. (Seriously, the people here look like they were thrust out of the womb pumping iron whilst simultaneously chomping on a piece of kale.) But my point is that even without a lean, sporty physique – I’m part of the 1% of the world’s population who has run a marathon and that makes me feel invincible. Running a marathon is about more than PBs, lycra and sports drinks. It’s about proving to yourself that you are strong. It’s about defying expectations. It’s about achieving the unachievable. It’s about surpassing the limits you’ve given yourself. It’s about realising that anything really is possible. So if you think you want to run a marathon, make like Nike and Just Do It. It may sound like a cliche, but trust me when I say, “If I can, you can”. Seriously, if I can repeatedly drag the vintage cheese shop I call a belly through 26.2 miles (or 42.2 kilometres) there is absolutely no reason why you can’t do it too. I’ve seen people of all shapes and sizes during my 8 years of marathon running. I’ve been lapped by bounding Kenyans and overtaken by men 60 years my senior. I’ve run alongside blind runners, wheelchair racers and amputees. I’ve even completed an entire race with an injured woman who was told by her doctor that she categorically should not run 5km let alone a full marathon. It is without a doubt the most supportive environment you’ll ever encounter. It doesn’t matter if you’re fat, thin, young, old, fast, slow, sprinting or walking… as long as you are there and you are trying – you are a hero. The bottom line is, running marathons gives me a sense of pride in myself that nobody can ever take away. It’s something I do just for me. It’s proven to me that my body and mind can endure and achieve far beyond what I ever thought possible. It has given me a renewed sense of confidence and shaped me into the person I am today: unafraid of a challenge and ready to conquer the world. Originally from Cardiff (Wales, UK), Siri is a native Welsh speaker and bilingual writer currently living in Sydney. With a background in film and television production (particularly comedy), she loves to write and to make people laugh (usually at her own expense). ​ An intrepid adventurer trapped inside the body of a couch potato, she is a copywriter, film critic and local news journalist by day and a comedy blogger by night. You can read more about Siri’s adventures in her Tales of a Welsh Lunatic blog.